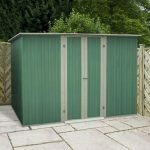 The subtle colour scheme of this metal shed helps create an aesthetic appeal that’s hard to beat for a non-timber garden building. 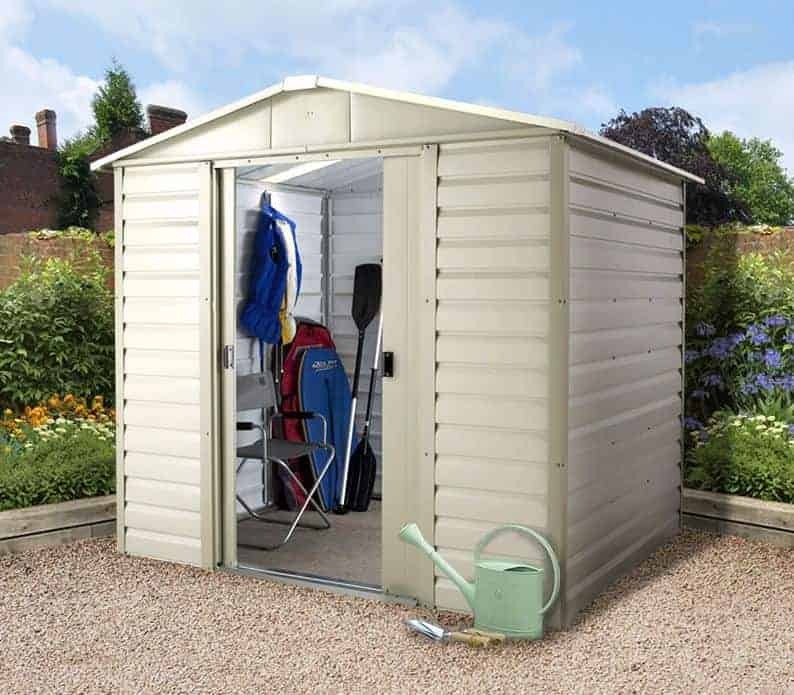 Painted inside and out, the paintwork isn’t only there for its visual appeal it also forms an extra protective layer to keep rain water out of the shed’s interior, so you can be confident that your contents will be kept dry whatever the weather. There are other features in this shed that also provide all important weather defences. The first of these is the apex roof, from which rain bounces or simply slides off. This is supported by the cladding below it, which being constructed from strong galvanised steel is very water resistant. It’s these excellent properties of water repellency that have allowed the manufacturer to provide a reassuring 12 year warranty against structural damage caused by rust. 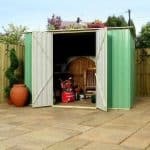 You might also like to see the top 20 8×6 shed currently on sale in the UK by visiting the WhatShed 8×6 shed awards league table. Another thing we really liked about this shed is that the accommodating surface area hasn’t been compromised by a shortened height, as we sometimes find. 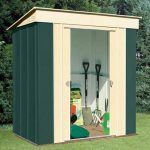 In fact, this shed has a taller than average eaves height, making it even better value for money. 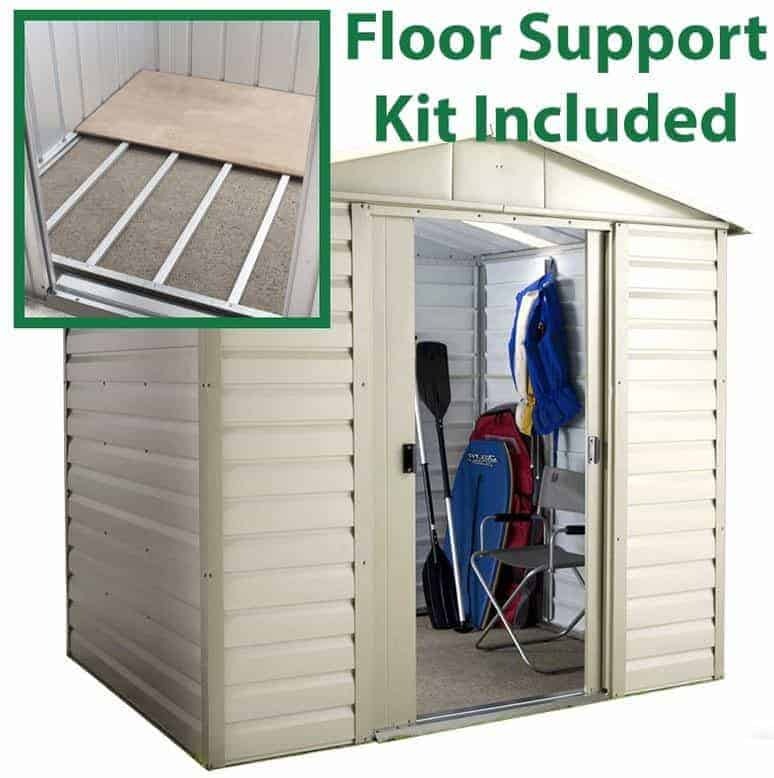 Another value adding feature is the floor support kit, giving the customer the chance to have either a concrete or timber floor. 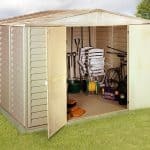 This metal apex shed looks strikingly different to most sheds of this kind that we review. The first noticeable difference is in the shiplap cladding, which gives a rustic wood effect to the shed as a whole, which even close up belies its metallic composition. The other differentiator is the colour scheme chosen which is a very pale green that looks both subtle and natural. In certain lights it can take on a silver birch like appearance, and we found the whole to be very pleasing. Sitting on top of the shed is the apex roof. Its pitch prevents water from ponding on the surface, as well as adding extra height to move around in or to stall taller items of gardening equipment. The ridge height is a very accommodating 2.15m and the eaves height is 1.83m, or six foot. 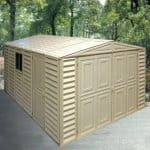 The overall width of the shed is 2.43m and the overall depth is 1.97m. Whilst the cladding on this shed is both light and thin, it was still slightly thicker than some metal sheds that we review. The steel at the heart of the cladding is strengthened through zinc plating that results from hot dipped galvanisation. This makes the substrate as a whole very tough, and creates a stable structure when the cladding and the slightly thicker frame are joined. We were pleased to see that the customer has a choice when it comes to the floor. 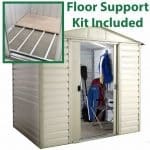 The quickest solution is simply to screw the shed into a pre-existing concrete base that is completely flat and that measures at least 2.15 X 1.83m. An anchor kit is provided for this purpose, so there’ll be no additional expense. Also included is a floor support kit. This is an easy to construct metal frame which creates a raised platform upon which a timber floor can be situated. It’s important to note that the timber isn’t included, but suitable timber such as decking boards can be purchased quite cheaply. The galvanisation process not only strengthens steel, it also enhances its water resistance. For this reason we would expect the cladding to last a long time without rust forming. The manufacturers, recognising this have supplied a 12 year warranty against perforations caused by rust. 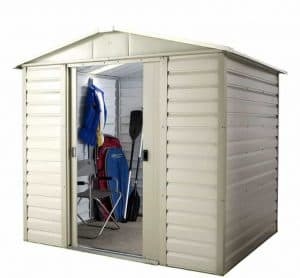 This is a couple of years longer than some warranties we see on metal sheds, but given that the shiplap design of the cladding also helps keep water out we would have liked to see the warranty period extended still further. One welcome point for many owners will be the lack of treatment required, so they can simply erect the shed and then forget about it. After reviewing many sheds that require a constant stoop to get in and out, we were really impressed by both the height and width of the double sliding doors, measured at 1.78m and 1.01m respectively. The doors slide easily, and because the mechanism is hidden internally behind the cladding, it’s not possible to gain access by simply lifting them off. Whilst there are no windows, the interior was still light and welcoming, and this is due to the translucent panels that make up the apex roof. Whilst giving the light a mellower appearance, it still provides enough natural light to see and work by during daytime hours. The translucent roofing panels provide the best of both worlds, as while they allow light in from above, they don’t allow passers by to see inside. That’s why we think the omission of windows is a useful security feature. We would also like a padlock to be included, especially as the handles are holed in preparation for one but unfortunately one will have to be sourced and bought separately. 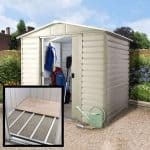 It has to be said that there aren’t a huge amount of optional extras to be bought with this shed, but this in itself can be taken as testimony to how much is already provided. One optional feature that will come in very useful is the shelving unit. It’s self standing so doesn’t need to be screwed onto the frame, and has four sturdy shelves. We liked the look of this unit, although it’s not inexpensive at £68.99. We aren’t surprised to find that this Yardmaster shed has such high quality components, as it’s what we’ve become accustomed to from them. We were pleased at how strong the shed feels when assembled, thanks to the galvanised cladding, so we can easily imagine it lasting for longer than 12 years without rust perforations appearing. With extra height being provided by the tall eaves, and a wide doorway allowing easy access to all corners of the building, we were impressed by just how much could be stored inside. There are lots of parts to put together, and therefore lots of screws and bolts, so read the instructions carefully and be prepared before starting the assembly process. With a friend to help, plan on taking at least five hours for the installation. We feel that this provides very good value for money, given both the quality of the building and its size. 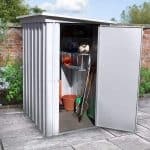 Final Thoughts: This could be the metal garden shed that converts people who’ve been previously committed to wooden sheds. It looks very attractive, so don’t be surprised when visitors mistake this for a shed that’s made out of a silver or light green tinged wood. It’s also highly effective at keeping precipitation out, without the owner having to take time out every year to add more wood preserver. We’d still recommend this process on the floorboards if a timber floor is installed, but we liked the fact that the customer is given the final choice in this matter thanks to the flooring support kit included.